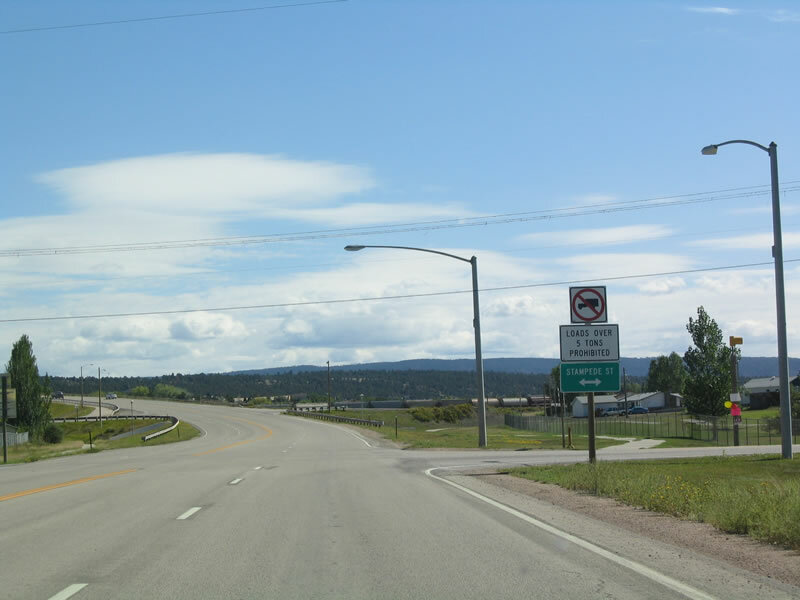 U.S. 16 runs from the East Entrance of Yellowstone National Park east to Interstate 90 and U.S. 14 in Rapid City, South Dakota. This route is truncated; it used to continue east to Milwaukee, Wisconsin, and Detroit, Michigan roughly along the current Interstate 90, Interstate 94, and Interstate 96 routes. U.S. 16 follows State Control Route 31 from Yellowstone National Park to Greybull, State Control Route 34 from Greybull to Worland, State Control Route 36 from Worland to Junction I-90 in Buffalo (with break at Junction State Control Route 59), State Control Route 1004 from Buffalo to Ucross, State Control Route 304 from Ucross to Wyoming 59, State Control Route 43 from Wyoming 59 to Gillette, Interstate 90 from Gillette to Moorcroft, State Control Route 44 from Moorcroft to South Dakota. Business U.S. 16 (Wyoming 452), which is the original U.S. 16 through Newcastle (mileposted as State Control Route 49). 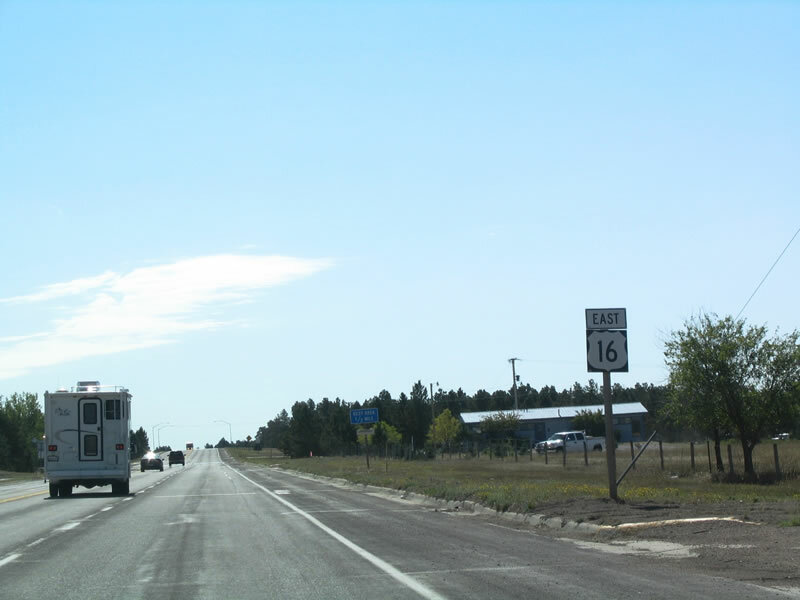 In addition, there have been several state auxiliary routes for U.S. 16 over the years: Wyo. 116, 216, 316, 416, and 516. Prior to the advent of U.S. numbered highways in 1926, roads in Wyoming were identified with names. In 1912, the Black and Yellow Trail was developed as a tourist route from Chicago to the Black Hills of South Dakota and Yellowstone National Park. The name "Black and Yellow Trail" is derived from the two major tourist attractions along its route: the Black Hills and Yellowstone. This route led to the first automobile entrance into Yellowstone, which opened in 1915. By 1926, U.S. 16 was commissioned over the route of the Black and Yellow Trail (officially known as the Chicago, Black Hills, and Yellowstone Park Highway). The name Black and Yellow Trail slowly faded into obscurity as the easier to remember numerical U.S. system took hold, but some still refer to U.S. 16 today as the Black and Yellow Highway. In 1926, the first year U.S. routes were designated in Wyoming, U.S. 16 began at U.S. 20 in Worland. U.S. 16 followed the current U.S. 16 through Buffalo, Gillette, and Moorcroft. At Moorcroft, U.S. 16 followed the modern-day Interstate 90 and U.S. 14 through Sundance into Sturgis. Modern-day U.S. 16 from Moorcroft to Newcastle was known as Wyoming 216. By 1933, U.S. 16 had two "children" in Wyoming, U.S. 116 (Upton to Sheridan) and the newly upgraded U.S. 216 (Moorcroft to Newcastle). U.S. 116 had an extension of Wyo. 116 from U.S. 310 in Lovell to U.S. 87E in Sheridan. Around the same time, Wyoming 316 and Wyoming 416 were waiting in the wings to become U.S. routes. Wyoming 316 ran from U.S. 87E at Midwest to U.S. 16 at Gillette (via modern Wyoming 387 and Wyoming 50), and Wyoming 416 ran from U.S. 20 in Greybull to Wyoming 116 in the Bighorn Mountains (via modern U.S. 14 through Shell Canyon). When U.S. 14 was commissioned into Wyoming in 1936, U.S. 116 and 216 and Wyo. 416 ceased to exist. In 1936, U.S. 116 and Wyo. 116 became U.S. 14, Wyo. 416 became Wyo. 514, and U.S. 216 became part of U.S. 16. 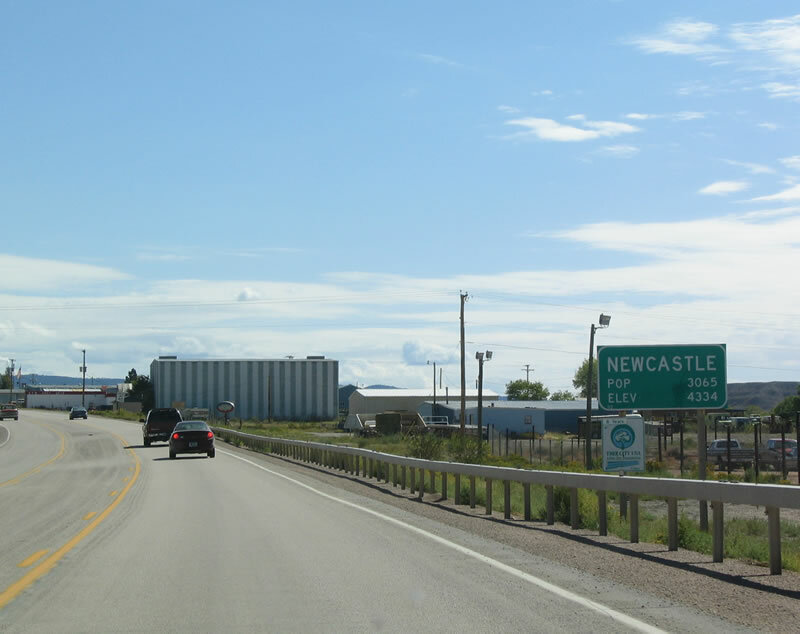 U.S. 16 was rerouted through Newcastle, while U.S. 14 (and Interstate 90) took over the former U.S. 16 through Sundance. Wyo. 316 was not immediately decommissioned along with its brethren; it was renumbered Wyo. 387 and Wyo. 50 much later. 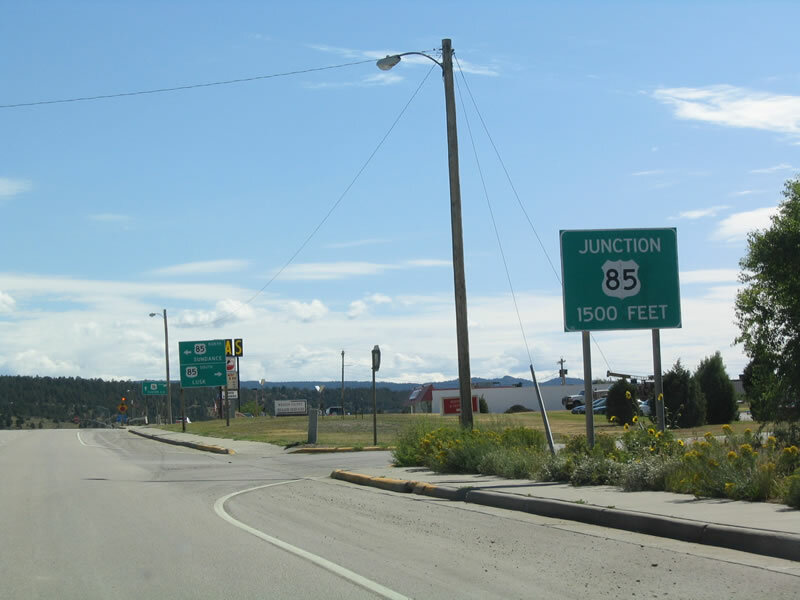 After this major change, the routing for U.S. 16 remained stagnant in Wyoming for the next thirty years. Then, in 1965, U.S. 16 was extended westward so it could make its way to Yellowstone National Park. 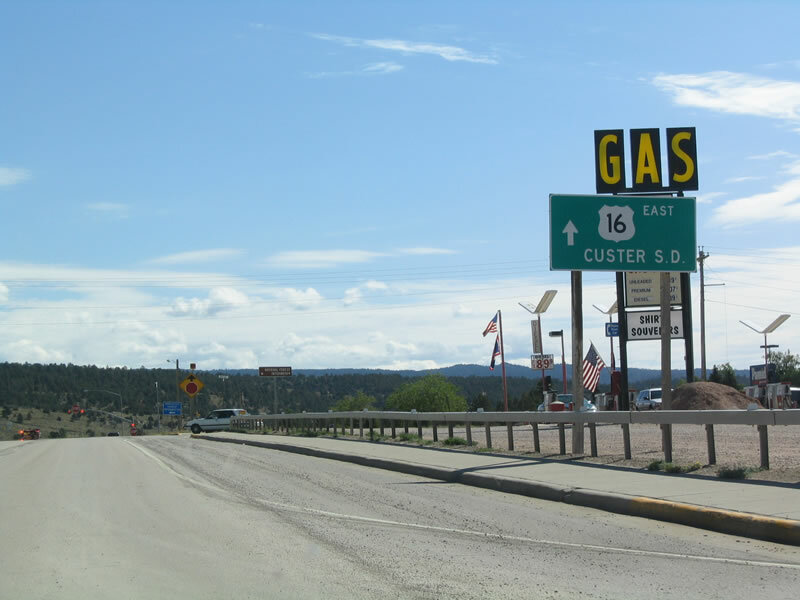 U.S. 16 was simply combined with U.S. 20 from Worland to Cody and with U.S. 14-20 from Cody to the East Entrance of Yellowstone National Park, so there was no new construction with this extension. All three routes end at that entrance, and only U.S. 20 resumes on the west side of the park. Even after U.S. 16 was extended, U.S. 16 slowly lost ground. This was due to the advent of the Interstate Highway System. Today, U.S. 16 is a shadow of its former route; it used to continue east from Wyoming to Sioux Falls, La Crosse, and Milwaukee along the Interstate 90 corridor. Some of this route is still marked as State Route 16, especially in southeastern Minnesota and most of its Wisconsin route. Via ferry, it crossed Lake Michigan to Muskegon. Then it followed Interstate 96 southeast into Detroit, its historical terminus. U.S. 16 begins it trek across the northern tier of Wyoming at the East Entrance to Yellowstone National Park. It is multiplexed with U.S. 14 and U.S. 20 between the park and Greybull via the Wapiti Valley and Cody. Several colorful rock formations -- including the Playground of the Gods and the Chinese Wall -- are along the Wapiti Valley portion of the route. The first-ever forest ranger station in the nation was built at Wapiti, right off the highway. In 1991, the U.S. 14-16-20 alignment was moved to higher ground along the Buffalo Bill Dam and Reservoir to accommodate a taller dam and larger reservoir. This dam is interesting because it is one of the first dams ever built under the U.S. Bureau of Reclamation. It was completed in 1910. In the same area, U.S. 14-16-20 passes through Shoshone Canyon, which is the longest combination of tunnels in Wyoming, with more than a mile in cumulative length under Rattlesnake Mountain. The highway finally passes through Colter's Hell (a semi-active geyser basin) just two miles west of Cody. The entire U.S. 14-16-20 routing through Wapiti Valley and Shoshone Canyon has been reconstructed through the late 1990s and early 2000s. Cody is the typical western tourist town in the summer: full of wax museums, historical sites, and even a statue of "Buffalo Bill" Cody. At Cody, you are afforded a choice. U.S. 14, U.S. 14A, and U.S. 16 all follow different paths between Cody and Gillette, and they each rendezvous with Interstate 90. 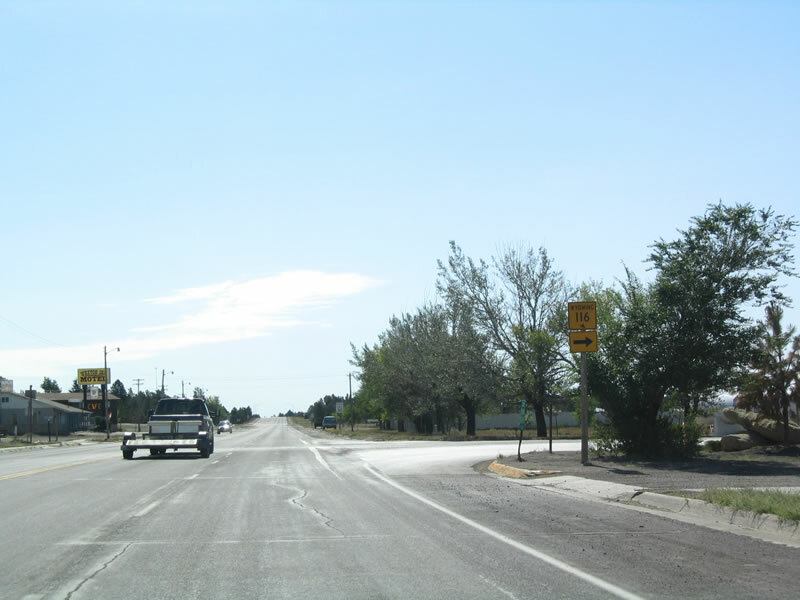 U.S. 14 and U.S. 14A serve Sheridan, while U.S. 16 serves Worland and Buffalo. The U.S. 14A alignment to Lovell leaves U.S. 14-16-20 at Cody, while the three main routes continue to Greybull. Continuing east on U.S. 14-16-20, it is clear that Park County is sustained by agriculture, ranching, and tourism. You'll notice cattle ranches and farms throughout the eastern part of the county. Many folks use this stretch of highway as the primary route between Yellowstone and points east, so tourists are quite common on this highway too. The highway enters Big Horn County west of Greybull. At Greybull, U.S. 14 splits off from U.S. 16-20. U.S. 14 heads due east, while U.S. 16-20 team up with Wyoming 789 and head south toward Basin and Worland. The elevation along this portion of the route is relatively low, around 3,870 feet at Basin. 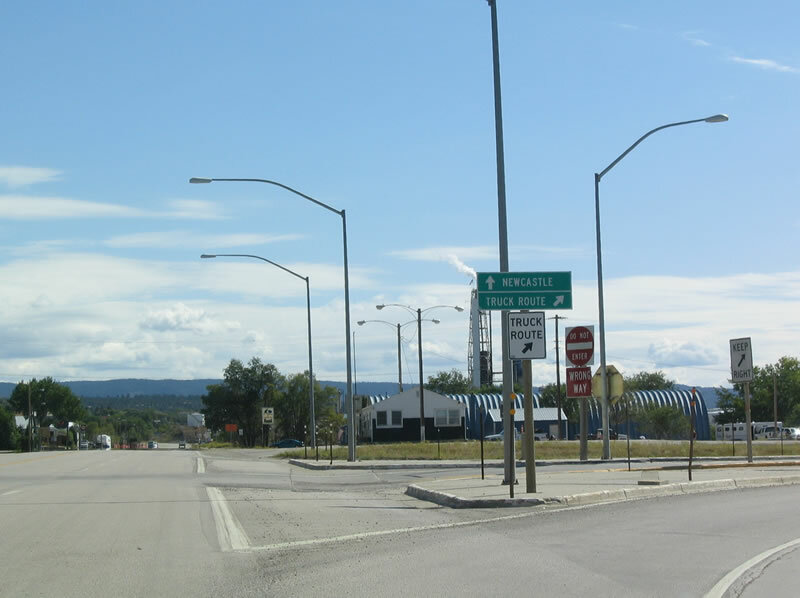 After Basin, the highway enters Washakie County. U.S. 16-20 and Wyo. 789 cross over from the west bank of the Big Horn River to the east bank before it hits Worland. The next picture shows the highway near Greybull. Worland has an interesting early history. It was founded in 1903, prior to the coming of the railroad. However, the railroad was routed on the wrong side of the Big Horn River. So the residents of Worland packed up their homes and belongings and literally moved the town from the west bank of the river to the east bank. This was achieved in the winter of 1906-7, when the river was frozen and therefore easier to cross. 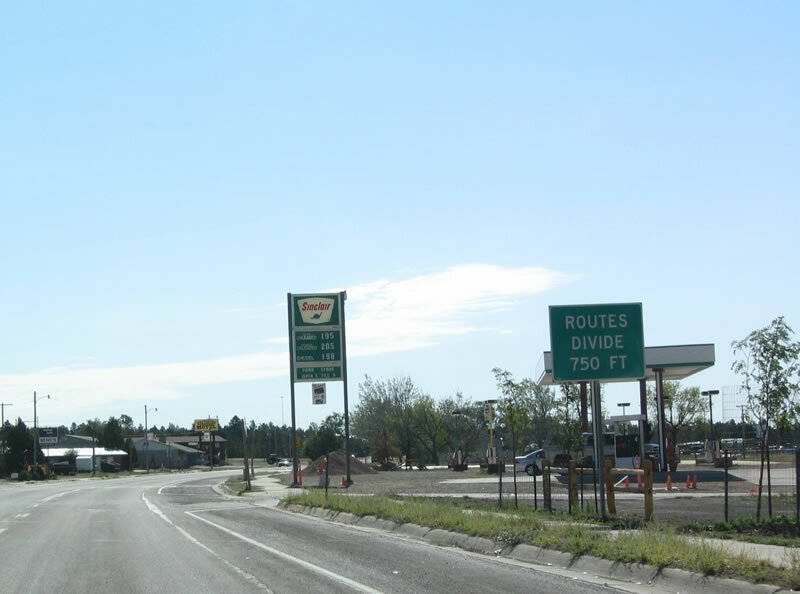 Today Worland is a thriving crossroads, marking the divergence for U.S. 16 and U.S. 20. 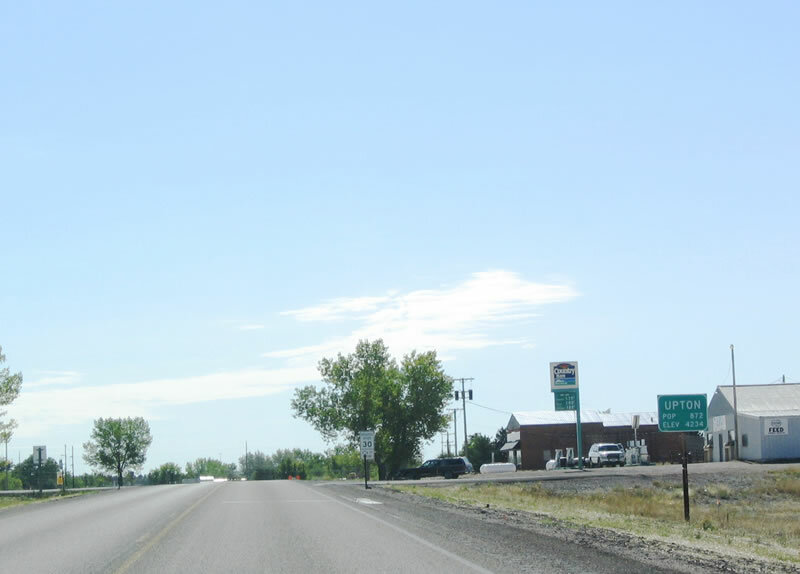 U.S. 16 turns east toward Ten Sleep and Buffalo, while U.S. 20 and Wyo. 789 continue south to Thermopolis. Ten Sleep was named because it was approximately a ten days journey between important Indian camps or geographical locations in the state. The main problem is, no one knows what these locations were. Suffice to say Ten Sleep is halfway between the two endpoints. 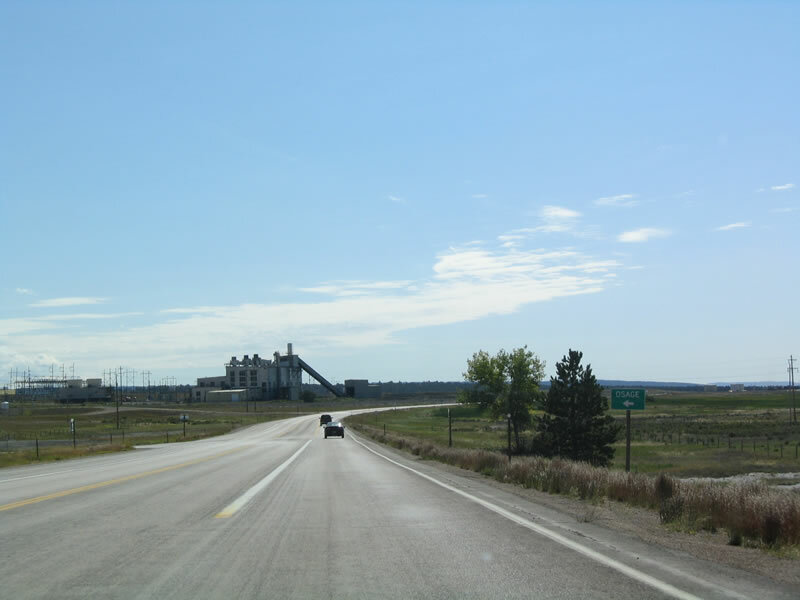 Washakie County is a leading producer of sugar beets, corn, small grains, alfalfa hay, and beans in Wyoming. Farmers irrigate much of the land here to ensure adequate watering. However, U.S. 16 quickly leaves this agricultural area behind as it enters Ten Sleep Canyon and the Big Horn Mountains. U.S. 16 is routed along the northwest side of the Ten Sleep Creek through the canyon, but it used to be located on the southeast side of the creek. Today the old road is used as a cross-country ski and snowmobile trail. Upon reaching the top of the mountains, U.S. 16 makes a steep descent into Buffalo and Johnson County. The grade is measured at six to seven percent in many places. At the top of the mountains, at the Powder River Pass, U.S. 16 is at 9,666 feet elevation. U.S. 16 coming down the east side of the Bighorn Mountains has two runaway ramps. One is right side, and the other is left side. Since it's a two-lane road, the trucks have to cross oncoming traffic to use it. The next picture shows the U.S. 16 Powder River Pass Summit. Coming into Buffalo, U.S. 16 meets old and new highways. U.S. 16 intersects with the U.S. 87 business route in downtown Buffalo, and it meets Interstate 25 and Interstate 90 just outside of town. Interstate 90 will parallel U.S. 16 to some extent for the remainder of its journey to Rapid City, South Dakota. When Interstate 90 was completed across South Dakota, Minnesota, and Wisconsin, U.S. 16 was mostly decommissioned in those states. Heading northwest out of Buffalo, U.S. 16 avoids Interstate 90 to rejoin U.S. 14 at Ucross. The section of U.S. 16 between Buffalo and Gillette was planned to be the original route of Interstate 90 until the straighter, more direct route was constructed. U.S. 16 then merges with U.S. 14 at Ucross. Historically, the section of U.S. 14 between Sheridan and Ucross was U.S. 116, but this route was decommissioned in 1936. U.S. 14 and U.S. 16 merge again, this time all the way to Gillette. This portion of the highway takes us through Sheridan County and Campbell County. The highway traverses mostly sagebrush and grassland through the Powder River basin; at the river itself, U.S. 16 is at an elevation of 3,600 feet. Compare that to the Powder River Pass -- nearly 6,000 feet difference! Gillette, the Campbell County seat, is a booming coal and oil town smack dab in the middle of nowhere. However, they say there's enough low sulfur coal in Campbell County to power the United States for the next 200 years. As a result, Gillette will be a force in the energy economy for years to come. U.S. 14-16 meet Interstate 90 again in this town, and they end up merging with the superhighway. Wyo. 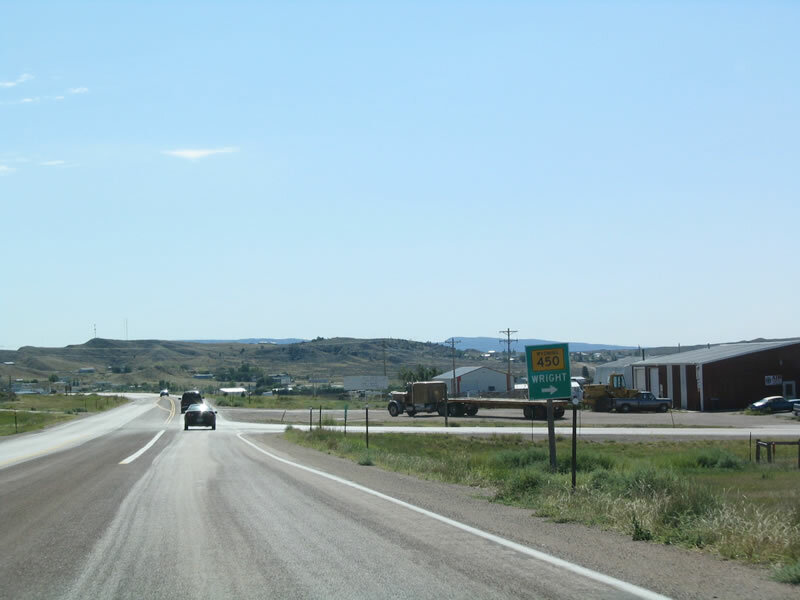 51, a secondary route, is the original U.S. 14-16 that serves Wyodak and Rozet. 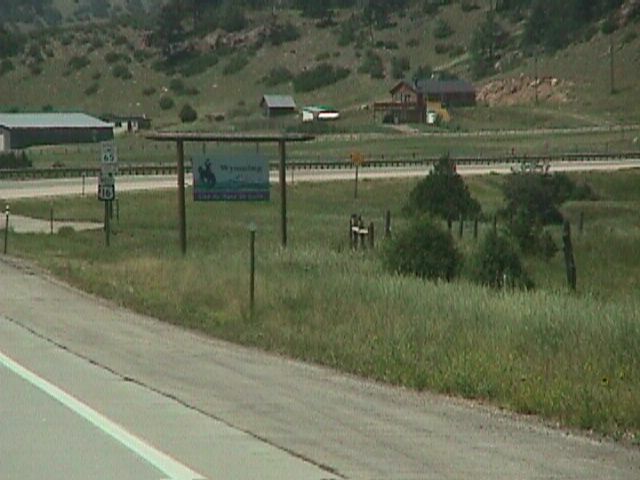 The combined Interstate 90, U.S. 14, and U.S. 16 finally enter Moorcroft, in Crook County. Moorcroft developed as a town because it was a stop on the historic Texas Trail, which was used to show cattle the way from Texas to Montana. Agriculture and ranching led to an expansion of Moorcroft in the early 20th century. In 1926, U.S. 16 used to continue east via the modern-day U.S. 14 alignment heading toward Sundance. At that time, the current U.S. 16 heading toward Newcastle was known as Wyo. 216. For a brief time in the early 1930s, this road was christened U.S. 216. However, in 1936, U.S. 14 was extended into Wyoming and U.S. 16 was rerouted to the south, taking over U.S. 216. U.S. 16 finally enters Weston County as it heads to Newcastle through the Thunder Basin National Grassland. The road is slowly gaining elevation as it heads toward the Black Hills. The speed limit on this road, as on all non-mountainous two-lane rural roads in Wyoming, is 65 miles per hour. Newcastle, the Weston County seat, lies just a few miles from the South Dakota border. It is the crossroads between U.S. 16 and the once-mighty U.S. 85. 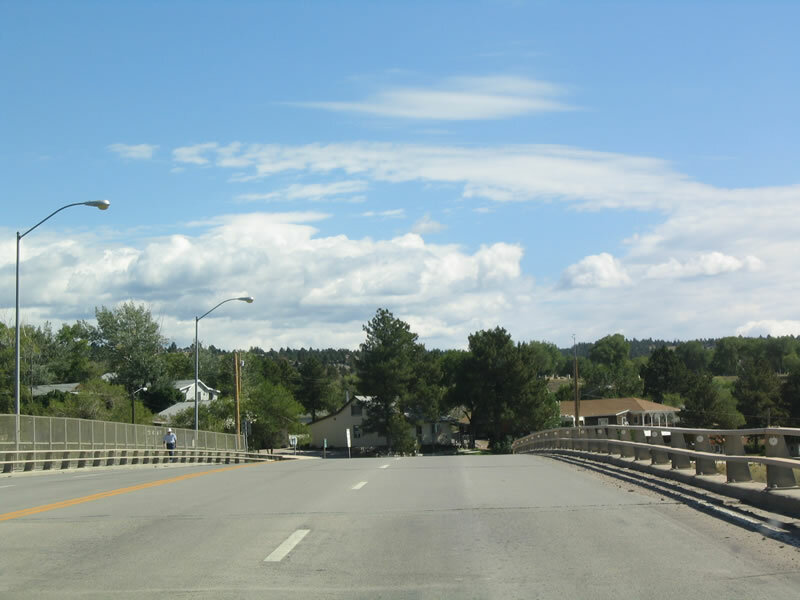 Since it was retracted over the past several decades with the construction of Interstate 90 and Interstate 96, U.S. 16 ends a mere 66 miles northeast of its crossing from Wyoming into South Dakota in Rapid City, South Dakota. Much of its remaining route in South Dakota runs through the beautiful Black Hills region, which includes Jewel Cave, Custer State Park, Mount Rushmore, and Black Hills National Forest. After departing Moorcroft, U.S. 16 skirts the eastern edge of the Powder River Basin. The route departs Crook County and enters Weston County while following the Burlington Northern Santa Fe Railroad southeast through Upton to Newcastle. Prior to 1936, this stretch of U.S. 16 was signed as U.S. 216; during that time, U.S. 16 was signed on what is today's U.S. 14. Still in energy country, coal, natural gas, and oil claims are scattered throughout the sagebrush laden countryside through which U.S. 16 continues to traverse. Photo taken 09/02/04. In addition to the official highway department sign, the Chamber of Commerce welcome sign to Upton indicates that this is "The Best Town on Earth." Upton has 872 people and is located at an elevation of 4,234 feet. Photo taken 09/02/04. Once in Upton, U.S. 16 follows Second Street through town. 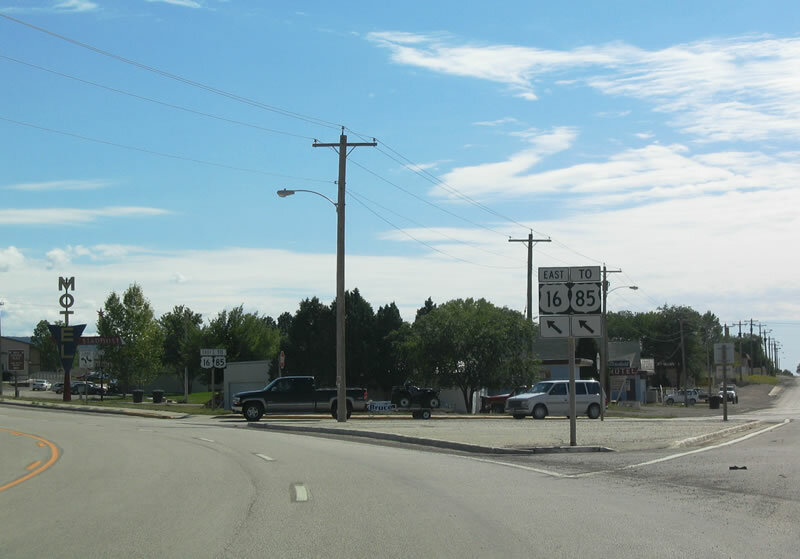 U.S. 16 travels southwest through Upton, and the U.S. highway meets Wyoming 116 north at Ash Street. 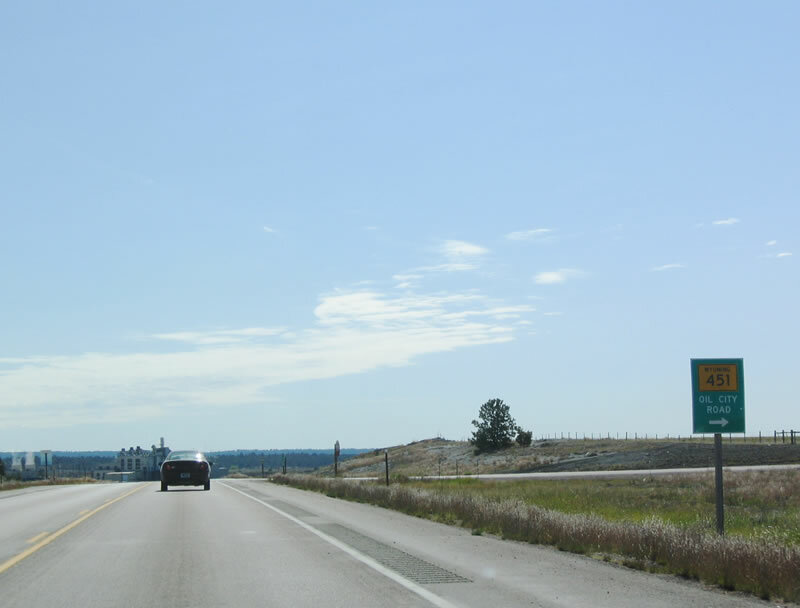 Wyoming 116 travels northeast to Sundance, where it meets Interstate 90 and U.S. 14. Photo taken 09/02/04. 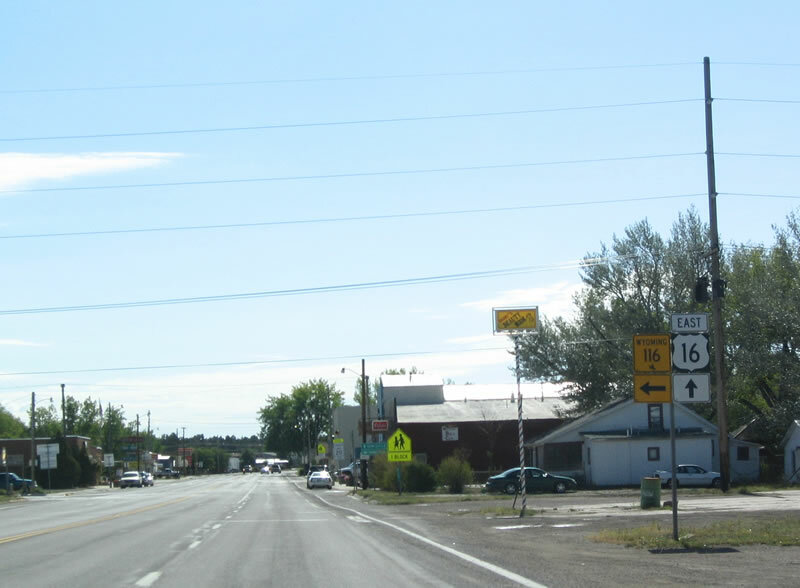 Although not properly signed here (the left arrow should also point straight), south Wyoming 116 briefly merges onto eastbound U.S. 16 for a few blocks. Note the lack of a directional banner on Wyoming 116, which makes it less clear that this is the first of two intersections with Wyoming 116. Photo taken 09/02/04. Turn left on Wyoming 116/Ash Street north toward Sundance. The storefronts on either side of U.S. 16 constitute the downtown area of Upton. Since there is no bypass route, all traffic must pass through Upton and obey the reduced speed limits through the town, including the 20 mile per hour school zone speed limit during certain times of the day. Photo taken 09/02/04. In another couple of blocks, the routes divide. 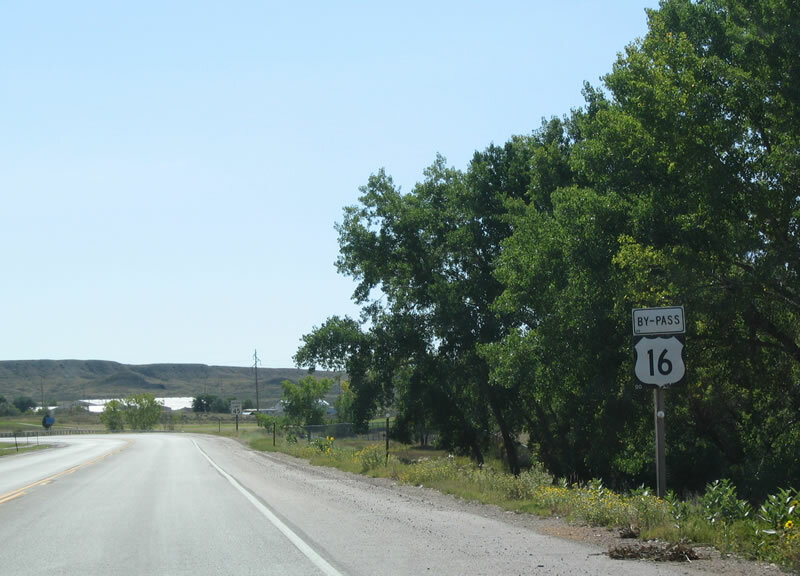 U.S. 16 continues southeast toward Newcastle, while Wyoming 116 turns due south to serve rural Weston County. Wyoming 116 reaches its southern terminus at Wyoming 450 just west of Clareton. East-west Wyoming 450 is a fairly long secondary route; it travels west toward Wright and east toward Newcastle. Photo taken 09/02/04. 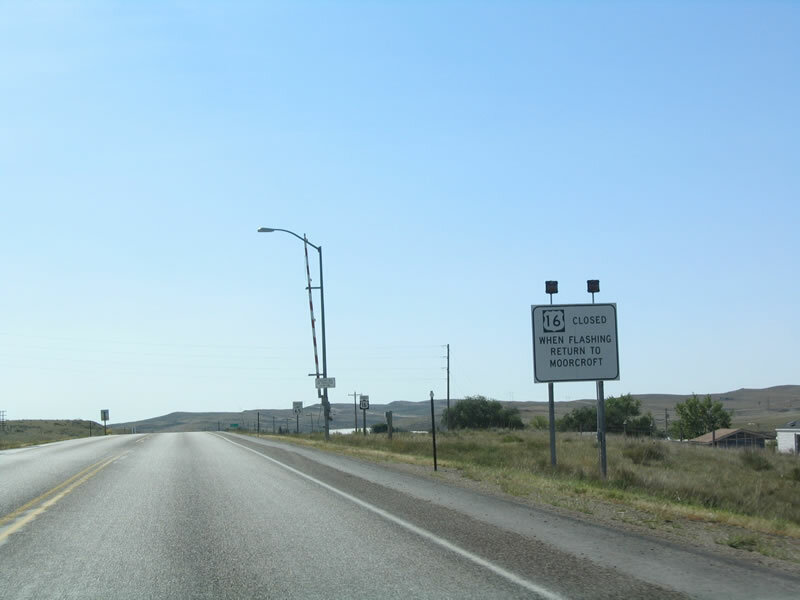 Eastbound U.S. 16 reaches the junction with Wyoming 116 south to the Thunder Basin National Grassland. The highway from Clareton to Sundance via Upton is not the first definition of a Route 116 in Wyoming. In the late 1920s and early 1930s, U.S. 116 existed along the route of today's U.S. 14 between Ucross and Sheridan. Photo taken 09/02/04. Now departing Upton, eastbound U.S. 16 approaches a rest area that serves both directions of traffic. The rest area is situated in a scenic environment with abundant pine trees. The bathrooms are very clean. 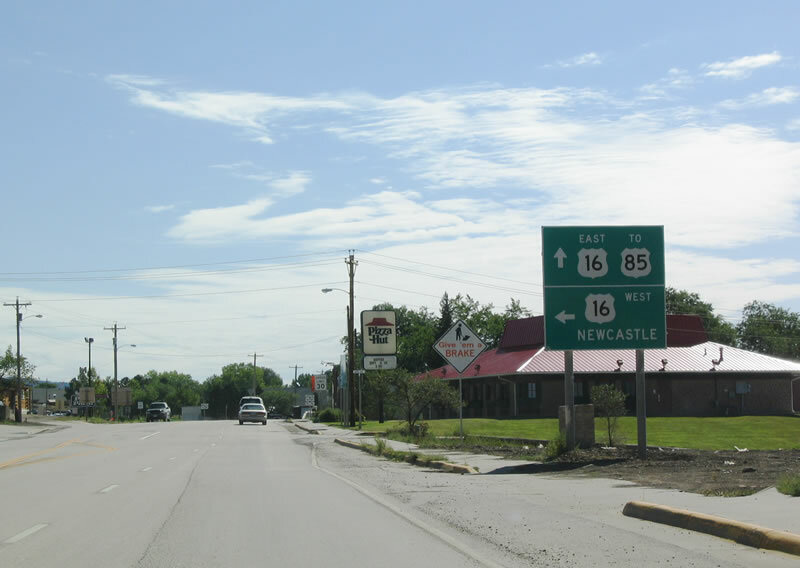 Continuing southeast, U.S. 16 travels toward Osage and Newcastle. Photo taken 09/02/04. Prior to passing by Osage, U.S. 16 east meets Wyoming 451 (Oil City Road), which travels west toward Beaver Creek. State maintenance of Oil City Road ends at the point where Wyoming 451 enters the Thunder Basin National Grassland at County Route 36B, which is close to Cowger Road. Oil City Road continues west as Weston County Route 22. Photo taken 09/02/04. According to the 2000 Census, Osage is home to 215 people. Industry, as well as ranching and mining, fuel the economy of this area. Turn left here at Sheridan Street to enter the town, which sits adjacent to the railroad. The old alignment of U.S. 16 passes through downtown Osage; while not signed as a business route, the old alignment follows Nefsy Avenue. Former U.S. 16 connects to existing U.S. 16 at both ends (between Oliver Road and Nefsy Avenue). Photo taken 09/02/04. Just prior to entering the city of Newcastle, eastbound U.S. 16 approaches a junction with Wyoming 450, Little Thunder Road. Wyoming 450/Little Thunder Road travels west through the Thunder Basin National Grassland. Administered by the U.S. Department of Agriculture (USDA), the Thunder Basin National Grassland administered together with the Medicine Bow National Forest and Routt National Forest in southeastern Wyoming and northern Colorado. Thunder Basin National Grassland is a patchwork of publicly owned properties that are adjacent to various privately held ranch lands. The grassland has plentiful wildlife and semi-arid sagebrush. Hunting and camping are permitted in the national grassland, but the various parcel ownerships require advance planning to ensure access to the desired public lands. Thunder Basin is found in the Powder River Basin, which is situated between the Big Horn Mountains to the west and the Black Hills to the east. Elevations range from 3,600 to 5,200 feet above sea level. Wyoming 450 ends at Wyoming 59 south of Wright. Photo taken 09/02/04. 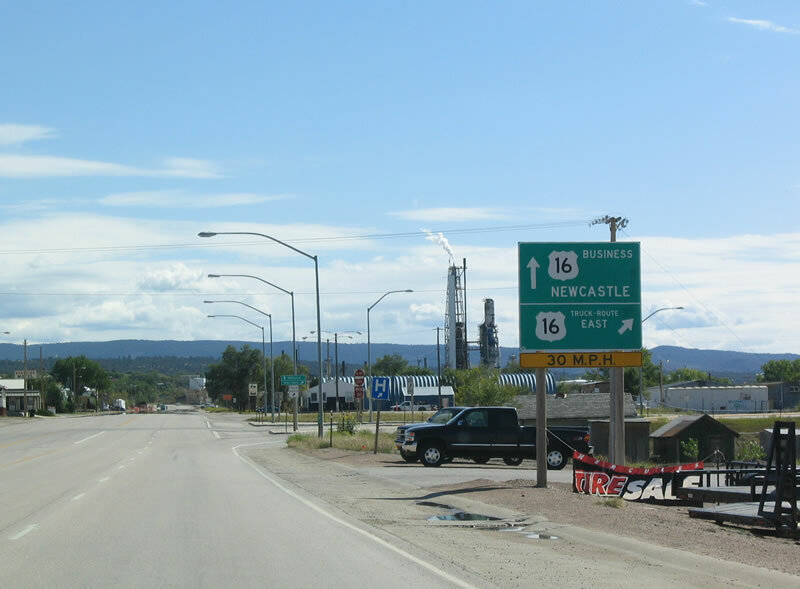 Eastbound U.S. 16 approaches the city of Newcastle, the western gateway to the Black Hills. 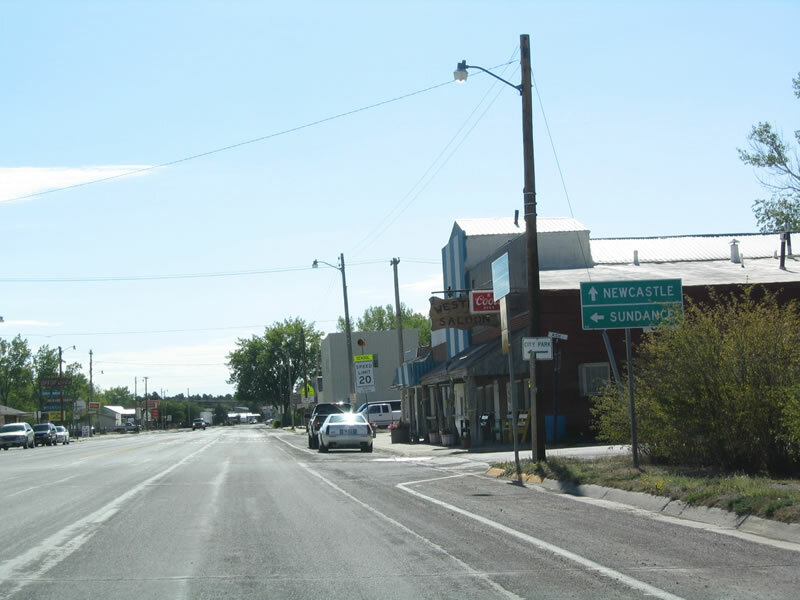 Home to 3,065 people and at an elevation of 4,334 feet above sea level, Newcastle is the seat of Weston County and is the most populous city in the county. Photo taken 09/02/04. After passing the city limits of Newcastle, U.S. 16 splits, with the main route bypassing downtown to the south and the business loop traveling through downtown. Note that the mainline is also the preferred truck route, especially since the bypass route travels over the railroad on a viaduct. The business route follows Main Street into Newcastle, then returns to U.S. 16 via Summit Avenue. Photo taken 09/02/04. To continue east on U.S. 16, turn right onto the bypass route via this short ramp. There are some services on the bypass, but most are in town. Continue east on Business U.S. 16 (Main Street) for most services in Newcastle. Newcastle has a historic downtown that features restaurants, stores, and shops. Newcastle is the Weston County seat, so the county courthouse is readily visible off Business U.S. 16 near the intersection of Main Street and Summit Avenue. Photo taken 09/02/04. After the business loop split into Newcastle, U.S. 16 east is signed as Bypass U.S. 16. Most maps show the bypass route as "regular" U.S. 16, but this sign assembly indicates otherwise. Photo taken 09/02/04. Stampede Street is the first intersection along the U.S. 16 bypass route. Photo taken 09/02/04. U.S. 16 next crosses the Burlington Northern Santa Fe Railroad on this viaduct. The railroad has followed U.S. 16 from Gillette and Moorcroft southeast to Newcastle; from here, it angles southeast toward Edgemont, South Dakota, along U.S. 18. The railroad avoids the Black Hills. Photo taken 09/02/04. After the railroad viaduct, Business U.S. 16 rejoins U.S. 16; Summit Avenue continues southeast to meet U.S. 85, but that is supposed to be a local route and not used by through traffic. The intersection with Summit Avenue is shown in the next photobox. Photo taken 09/02/04. Since this sign indicates that traffic for U.S. 85 should use U.S. 16 east, through traffic should not continue straight onto South Summit Avenue. Photo taken 09/02/04. In Wyoming, U.S. 85 (also known as the CanAm Highway or Old Deadwood-Cheyenne Stage Line) is a major north-south highway that extends from Cheyenne north to the Black Hills via Torrington in Goshen County, Lusk in Niobrara County, and Newcastle in Weston County. 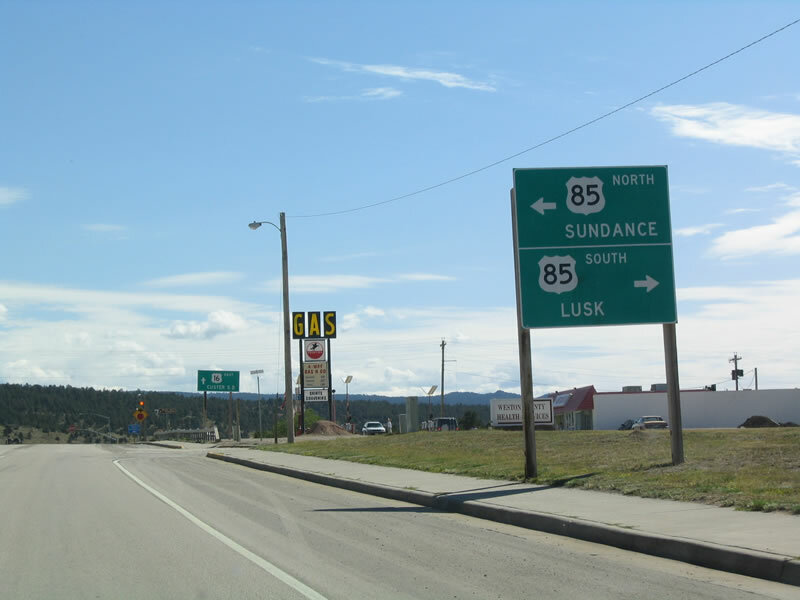 Follow U.S. 85 north to Sundance (via Wyoming 585) and destinations in South Dakota, including: Spearfish and Sundance (via Alternate U.S. 14) and Deadwood and Lead (via U.S. 85). Photo taken 09/02/04. Indeed, the control cities for U.S. 85 are Sundance to the north and Lusk to the south. Eighty-one miles separate Lusk and Newcastle, and 41 miles separate Sundance and Lusk. Cheyenne is some 220 miles south of Newcastle via U.S. 85. Photo taken 09/02/04. A four-way stop governs the flow of traffic between U.S. 16 and U.S. 85. Note that U.S. 85 mostly avoids the Newcastle area, with the direct connection to the city provided via U.S. 16. Continuing east from here, U.S. 16 travels into South Dakota about ten miles hence; Custer, South Dakota, is the next major city along the US route. Also continue east along U.S. 16 toward the Black Hills and Custer State Park via Alternate U.S. 16. Photo taken 09/02/04. Westbound U.S. 16 enters Wyoming near Newcastle. Photo taken by Jim Teresco, 7/25/99.